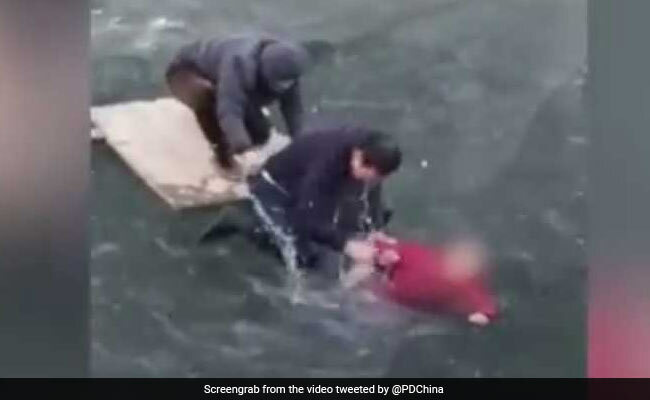 Shi Lei, 54, rescued a 70-year-old woman from a frozen river. A woman trapped in an icy river was rescued by a Good Samaritan who crawled across the ice and smashed it with his hands in order to save her. The incident took place on Tuesday morning in northern China's Hebei province. According to the South China Morning Post, Shi Lei, 54, saw an elderly woman fall into the river and immediately stopped his bike to help her out. A video on People's Daily, China shows him smashing the ice with his hands and pulling the woman out. Another man present at the scene helped the two by holding on to them, while passers-by were heard saying that an ambulance was on its way. "It was really freezing in the water, but I didn't have time to think about it at the time," Shi was quoted as saying to the South China Morning Post. He reportedly went home after the rescue, drank a bowl of ginger water and went to work.